I have been planning to learn knit for ages. I even had the needles and yarn ready. I just kept putting it off. You see, I see many yarns about the place that are so gorgeous, but arent really suited to crocheting. Speckled yarn in particular doesnt lend its self to crochet. So I really want to learn to knit so I can make the most of the full spectrum of yarn! Anyways, I was in a beautiful little yarn shop – The Yarn Dispensary in Faversham last weekend. It was full of gorgeous yarn. My Fiance was falling in love all over the shop, and it reminded him of his long held dream to knit socks! And then it made him sad because he thinks he is rubbish. He often asks me if I can work out where he is going wrong, but as I dont knit its all a foreign language to me. So I came up with an idea. I suggested he teached me how to knit then we could make a regular thing out of sitting down together to knit and drink tea. So out came the bag of Stylecraft Batik I had purchased for knitting and we got started. He is a good teacher! Here is my first ever swatch. I am quite pleased. Not bad for a first attempt. The plan is to make lots of swatches to learn different techniques together then sew them all together into a crazy sampler blanket – a sort of future heirloom that we both made with love and care. 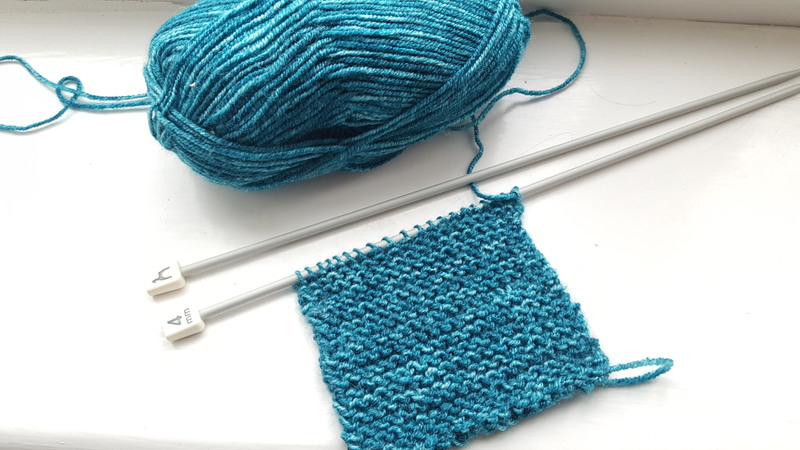 Now I have the bug – I ordered some bigger hooks to have a go with some chunky yarn. I cant wait! One of the things I learned early on is its actually more simmilar to crochet than I originally thought. The Cast On, for example, is basically a chain, but instead of having just the last chain on the end of your hook, its kinda like having the top loop of all if the chains in the needle.